Volbeat, Denmark's gift to all rock arenas, played for the first time in Ilosaarirock and nailed it. 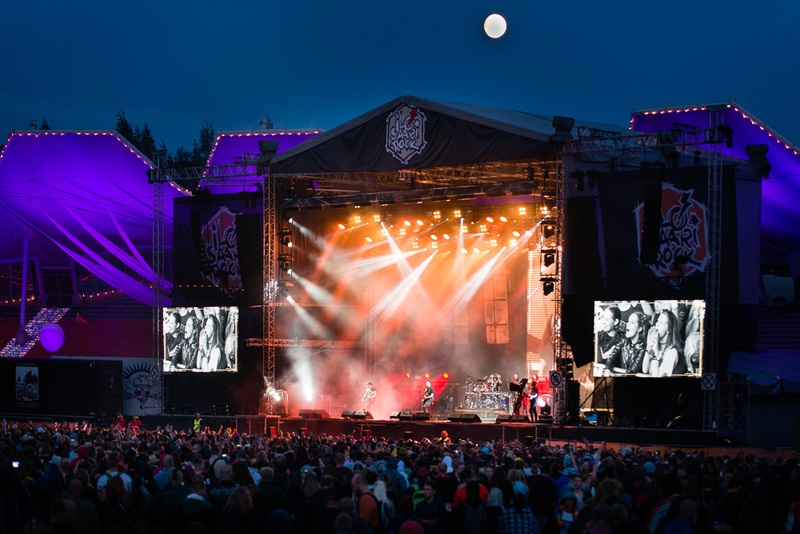 The festival goers gather to the Main Stage on Sunday evening to listen to one of Europe’s biggest rock bands. There are suspicious looking dark clouds in the sky, but no real signs of rain. This weather suits the ambiance of the upcoming gig well. No need for romantic sunsets when the rough sounds of this band ring out. I swear, when the first song The Devil’s Bleeding Crown begins the size of the audience doubles in just a few seconds. The guitarist Rob Caggiano makes the crowd jump up and down with the commands of his instrument: when the riff says jump, the crowd can only ask; how high? The singer Michael Poulsen needs not to raise his fist but a few times and the audience is filled up with waving hands in response. 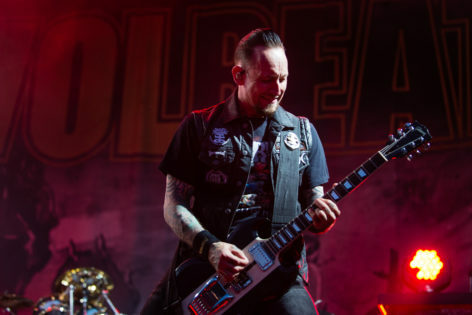 Poulsen does not waste time for stage patter, the songs come one after another. A clip of I only want to be with you by Dusty Springfield is surprisingly played between rough rock songs. Volbeat’s version of the 60’s classic does not pale in comparison to the original song of the American soul artist. – Thank you very much. Kiitos. Long time no see. What you’d been up to? Poulsen greets the audience. Volbeat plays an homage to old rockers, such as Elvis Presley and Johnny Cash. A picture of Johnny Cash is projected to the back of the stage as the band plays a cover of Ring of Fire . The lyrics to this classic are not well known, but the crowd eagerly joins to Sad Man’s Tongue which is heavily inspired by Cash’s Folsom Prison Blues. The sound of the band is also influenced by rockabilly and this can be heard for example from the rhythm of songs such as the radio hit Lonesome Rider. – You don’t know Cash but you know this one? Well, you’re still good people, Poulsen jokes around. The energetic gig comes to an end with an upbeat The Mirror and the Ripper and Poulsen tells great news to the audience who are showing no signs of weariness. – It’s been an honor to play for you. We’ll be back in October! Poulsen reveals.